Terminal 5 isn't necessarily my favorite venue in the city - muggy air, sticky floors, always seems over capacity - but all of that wouldn't stop me from seeing the badass acts the venue hosts. 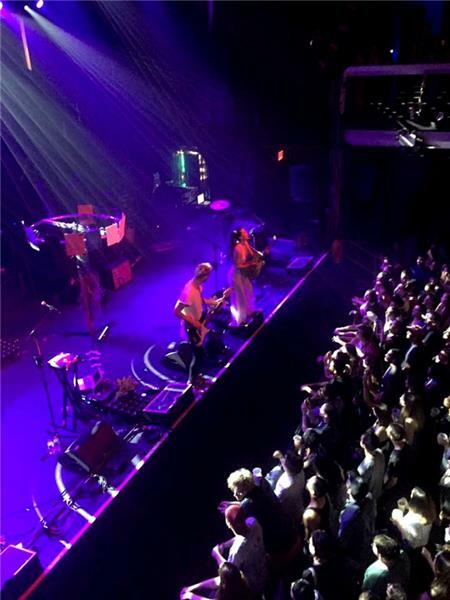 I didn't think I could dance as much as I did on Tuesday night when I saw Sofi Tukker and St. Lucia at Terminal 5. Sofi Tukker has continued to blow my mind since I discovered them this year but this was the first time Ive seen them live. The New York-based duo consists of Sophie Hawley-Weld (vocals, guitar) and Tucker Halpern (electronic genius) and I think the best way to describe their sound is Brazilian/electronic jungle-pop. Sophie was wearing a retro-inspired, white jumpsuit and Tucker was wearing a long, white tee with black, red and white Air Jordan 1s - already setting the tone that these two are pretty damn cool. Their stage setup was minimal with a few little plants and center stage was what they call their "book tree" of beats. They bang on the ends of the tree to produce beats and the ends are decorated with all the books of a Portuguese poet that inspired a lot of their lyrics. During the show, Sophie said, "This is our book tree, its the most important member of our band." They opened up the show with "Hey Lion" off their debut-EP Soft Animals, a track with the most recognizable deep house beat with a little bit of an Afro-Cuban rhythm. The album's show-stopping track was "Matador" where Tucker hopped around the book tree throughout the song as Sophie did some interpretive-like moves and for "Awoo," Sofi Tukker brought out Bette Lemme to help out with the vocals. This track was particularly unique because for most of the song, the three members would stand almost completely still as they sang the lyrics but would dance around during the breaks, which definitely got the crowd going. 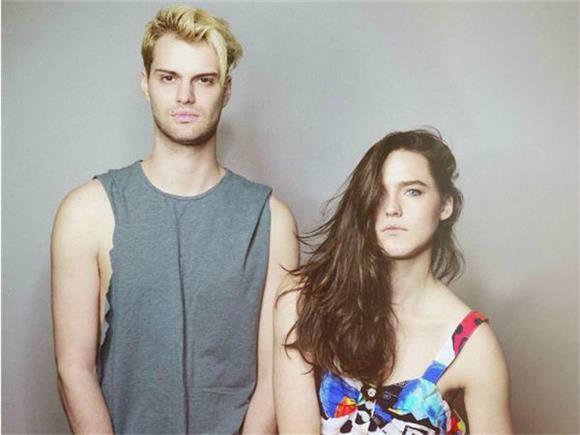 Sofi Tukker closed with their first single, "Drinkee" and supposedly, the guitar riffs heard in this track were created when during the first week Sophie picked up an electric guitar. The song includes layered underlying sounds, distorted electric guitars, bongos and cowbells, which was definitely the highlight of their set. Sofi Tukker is extremely new to the game but their live show was one of the most unique acts out right now. I would've been more than satisfied if I had to go home after Sofi Tukker but St. Lucia is a band that will never disappoint. It's hard to compare to the vibrant enthusiasm they bring to their performances and right from the start, they played "Closer Than This" and the room erupted into a singalong whenever the chorus would roll around. I'm pretty sure whenever I see St. Lucia live, Jean-Phillip Grobler has a fan set up at his feet for the "hair blowing in the wind" effect because he looks like an angel every time. Some other highlights of St. Lucia's set were "Love Somebody" from 2016's Matters - which is a track you cant help but snap along - "All Eyes On You" and "Elevate" from When the night. At one point during "Physical," Grobler ran across stage and jumped to run through the photo pit then went back on stage to jump around and shake his hips. I wish I had the dance moves (and energy) like that guy. He really showed off his moves when St. Lucia closed with "Dancing On Glass" and from the moment the catchy synth-pop introduction started, everyone was already movin'. And it wouldn't be a Terminal 5 show without getting beer spilled on you during the last song. Heres to you, Sofi Tukker and St. Lucia - two phenomenal bands who couldn't complement each other more.